Claassenia sabulosa is the only species in an exclusively western genus. It is also the West's sole representitave in the subfamily Perlinae. Overall, its the least important species among the common western Perlidae . But it is paradoxically the most important at the time of its greatest activity. This is because it is primarily a late Summer/Fall emerger that can be found as late as October in many locations, long after the hatches of its siblings have been relegated to memory. Besides time of year, the adults of this similarly sized large species can easily be distinguished from the better known western Perlidae by the males having brachypterous (Brachypterous: With short or or addreviated wings.) 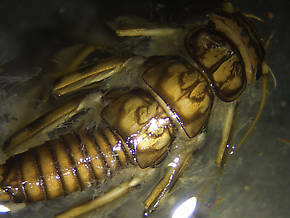 (severely shortened) wings and a unique oval hammer (Hammer: A smooth clearly defined chitinous area on the ventral surface of the ninth abdominal segment of some male stoneflies used for drumming up mates.) on the 9th sternum that is clearly visible without the need for magnification. 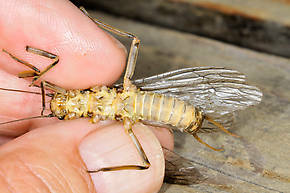 The ocelli of a male Isonychia bicolor mayfly spinner. Ocellus: A simple non-compound, single lens eye found in many arthropods. Mayflies have three ocelli in between their compound eyes.) as opposed to the hour glass shaped vertical marking on Hesperoperla. As a Perlinae, the shape of its head's posterior (Posterior: Toward the back of an organism's body. The phrase "posterior to" means "in back of.") margin often appears concave (due to the raised transverse occipital (Occiput: The back of the head.) ridge). This is opposed to the convex shape of the other large western perlids, giving Claassenia a unique appearance. Their antennae and tails are noticeably much longer also. No other aquatic insect rivals them for size and sheer calorie content when they are on the water. The only other truly large aquatic insects that even come close at this time of year are Dicosmoecus caddis, though they usually hatch later. While approaching in wing length, the caddis doesn't come close in body mass. The angler fortunate to come across a major flight of these critters in the Fall is apt to have some tremendous action as the trout prepare for winter by feeding ravenously. Female Claassenia sabulosa (Golden Stone) Stonefly Adult View 3 PicturesI think this is one of the most poorly understood of the golden stoneflies. It is rare to see any articles about it or fishing the hatch. It emerges late in summer usually on medium to large rivers.The adults are quite secretive but it is something to see the adults run across the water surface. These guys can really run. 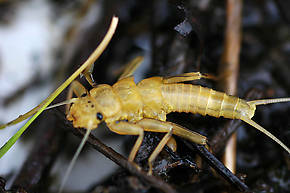 The males have short wings.The females are up to 1 1/4 inch long rivaling the salmonfly as the largest adult stonefly in the west.The adults are not real golden in color, especially the females which are more of an off yellow to off white abdomen. In handling the adults it is obvious that they shun direct sunlight. I find them by turning over rocks close to the water's edge. Claassenia sabulosa (Golden Stone) Stonefly Nymph View 2 PicturesThis is a stonefly that has recently molted and has not yet darkened. Brachypterous: With short or or addreviated wings. 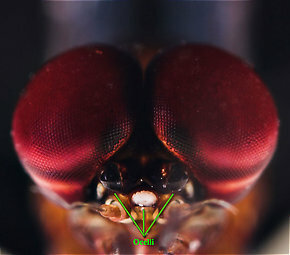 Ocelli: A simple non-compound, single lens eye found in many arthropods. Mayflies have three ocelli in between their compound eyes.